It is uncommon to deliberately add duplicate triples into a store. It is usually the result of loading data files twice (or loading different files which happen to contain some duplicate data). Uncoordinated hand entry by multiple persons also may result in loading duplicates. There also may be reasons to load duplicates, such as wanting to determine whether separate large data files contain duplicate data. This may be difficult to determine by other means, particularly if the files use different formats. Unless duplicate suppression is enabled (see below, the AllegroGraph system neither detects nor prevents loading of duplicate triples. It is not an error for a store to contain duplicate triples. But duplicate triples do use resources unnecessarily, can cause slowdown of query processing, and may cause misleading results, particularly for queries involving counts of triples with specific components. A user can be restricted from viewing certain triples (see Security Implementation). The triples that can be viewed by a user are visible to that user. When we talk about duplicates in this document, we always mean duplicates among the triples visible to the current user. It may be the store contains a single triple which is visible to the user and additional SPO-identical triples which are not visible (because the user is restricted from seeing triples with the graphs of the other SPO-identical triples). Even if duplicate triples are visible to a user, the user may not have permission to delete some or all of the duplicates (again, see Security Implementation). Any command to delete duplicates issued by the user will not delete duplicates the user does not have permission to delete. 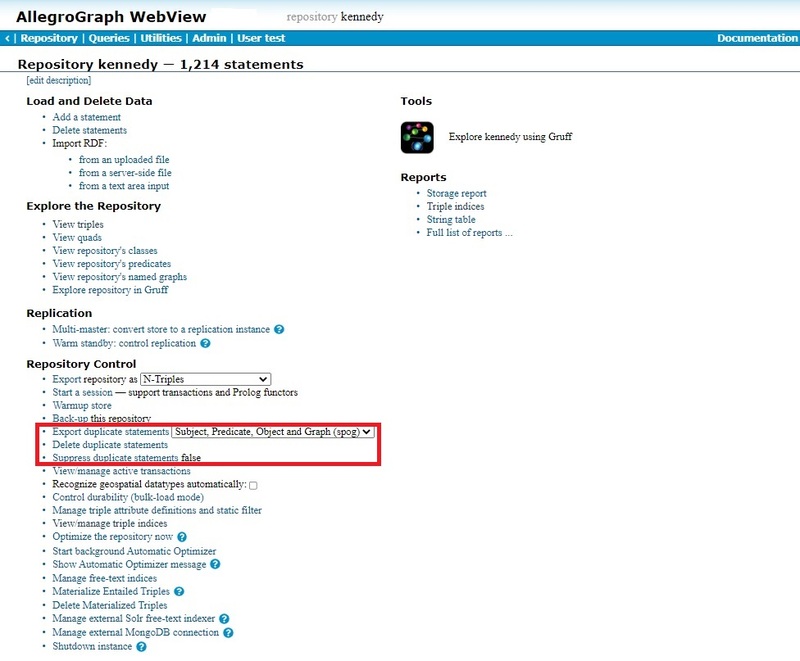 The functionality (described below) for listing and deleting duplicate triples is not supported in federated stores (see AllegroGraph Federation in the Introduction). You can list/delete duplicates in each individual store which makes up the federation, but not in the federated store itself. For each triple, we have shown the Subject, Predicate, Object, Graph, and a notional triple-id. Note that while the triple id of a triple can be accessed progammatically, users have no control over what id is assigned. We provide these made-up values just so we can talk about the triple ids in our example. All five triples are SPO-identical. The first three and the last two are also SPOG-identical but none of the first three is SPOG-identical to either of the last two. The triple with the lowest id will remain after duplicate triples are deleted. You can arrange that duplicate triples be deleted at commit time. Then there will never be any new committed duplicates to delete (though any committed duplicates already in the store when you implement this feature will remain until you take action to delete them: enabling duplicate deletion at commit time never affects already committed triples). When triples are deleted they are not immediately removed from indices because they must remain in all indices until all transactions which may potentially need to see those triples (such as transactions that started before the triples were deleted) have completed (been committed or rolled back). A triple that cannot possibly be accessed by any live transaction is referred to as an inaccessible triple. AllegroGraph provides a facility to purge inaccessible triples from indices. See Purging Deleted Triples for a complete discussion of deleted triple purging. Select which type of duplicates you are interested in, and the click on the Export duplicate statements choice. You will be prompted for a filename and location, and the duplicates will be written to that file in Nquads format. Those triples are the triples which will be deleted if you request duplicate deletion. Note that triples which are not visible to the current user will not be written to the file even if they are duplicates. Select the desired deletion mode and click OK. The duplicates of the selected type will be deleted from the store. If, before deleting duplicate, you wrote a file of duplicates, you can restore the deleted duplicates by loading the file (see Data Loading). You can have the system automatically delete duplicate triples at commit time. In the Webview interface, you can enable this feature using the Suppress duplicate statements choice on the Repository page. Clicking on that choice displays a popup window with a menu of three choices: do not suppress duplicates at commit time, suppress SPOG-identical at commit time, suppress SPO-identical duplicates at commit time. The mode argument can be spo or spog (the default). The Java interface is described in the Javadocs. The relevant class is the AGRepositoryConnection class and the methods are getDuplicateStatements() (for getting duplicates), deleteDuplicates (for deleting). Note you cannot enable supressing duplicates at commit time using the Python interface. See the Python API document. See Deleting triples. The function get-duplicate-triples returns a cursor of duplicates. The function delete-duplicate-triples delete duplicates. The function duplicate-suppression-strategy controls whether duplicates are deleted at commit time.